What is a stretch ceiling system? 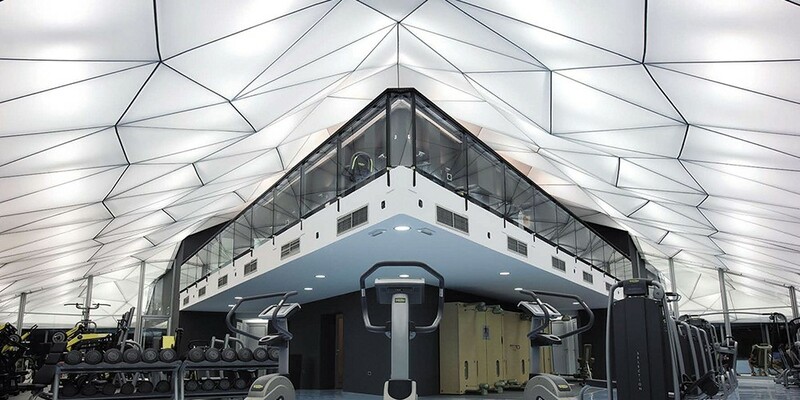 A Stretch Ceiling is a suspended ceiling system consisting of two basic components – a perimeter profile and a lightweight Polyvinyl chloride membrane which stretches and clips into the track. In addition to the ceilings, the system may also be used to create wall applications, ceiling and wall murals, suspended 3-D panels, or freestanding features. They can be given virtually any shape. 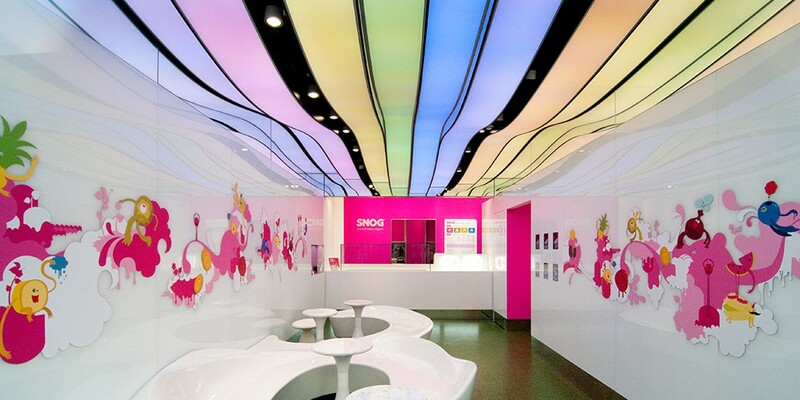 Stretch Ceiling Systems allow the incorporation of all types of light fixtures, grilles, sprinklers, etc. by the use of proprietary background support. 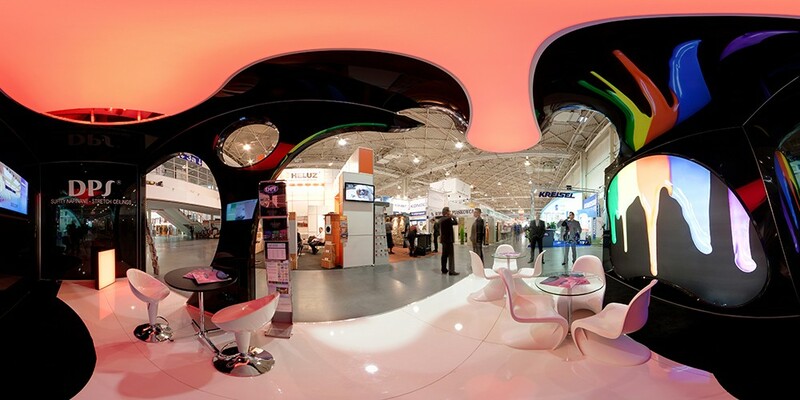 Our membrane material is a 0.18mm thick PVC based fully recyclable Stretch Membrane. It is made from a special polyvinyl chloride base that is guaranteed to be cadmium-free. The material comes in a vast array of Colors and Finishes including Matte, Satin, High Gloss (mirror like), Metallic, Perforated, and Translucent for lighting diffusers, backlighting, & projection. The material can be printed or painted for additional effects. It is entirely waterproof, washable, and impermeable to vapor. The Material is maintenance free, hygienic, non toxic and is Class A (1) Fire Rated in accordance with ASTM E84. The lightweight sheets are made from roll material in order to form any shape and size up to 500 sf. in one piece. Larger pieces are simply ultrasonically welded together. Each panel incorporates an ultrasonically welded ‘Harpoon Edge’ which clips into the profile. Typically, the Aluminum Semi-Concealed profile is the preferred choice for most architects and designers, enabling curves, domes, vaults, and many other shapes to be formed with ease. The unique Stretch Ceiling System offers a fantastic opportunity and the freedom for added dimension in the design potential. 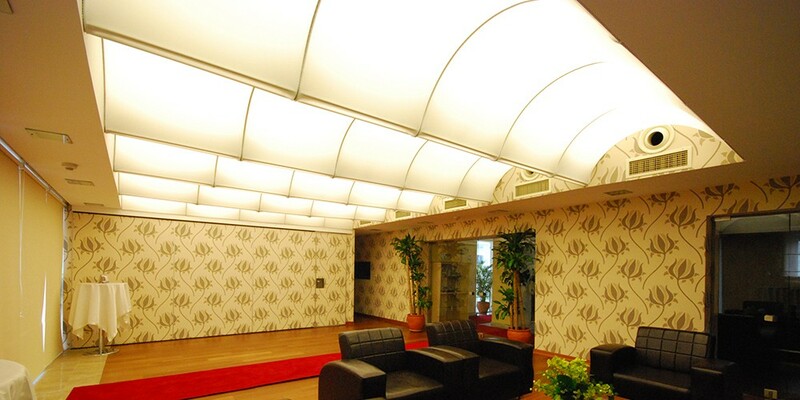 The versatile profile system allows the ceiling to be installed as a simplistic flat ceiling or in varying forms such as pitched, curved, vaulted, domed, 3-D, or circular. This distinctive system offers a palette of colors, choice of texture, and has the ability to create clean-and-cool or loud-and-colorful ceiling features and lighting effects.